OU Apps for iPhone and Android! 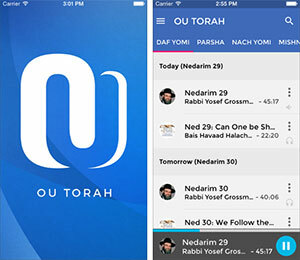 The OU Kosher app for iPhone and Android is much more than a guide to OU Kosher products. It includes: Search engine access of OU’s product index – OU’s kosher product alerts – Newly certified products updates – OU Kosher FAQs – OU Kosher question/general information hotline. Just tap on the hotline button and ask your question! You can also submit a question to oukosher.org just as easily. It’s like having a yeshiva in your pocket! The OU Torah app provides instant access to the world of Torah made available by the Orthodox Union on OUtorah.org. With a single click, users can follow along with the OU’s many and varied daily learning programs, including Daf Yomi, Nach Yomi, Mishna Yomit, and Mishnah Brurah Yomi, as well as many insightful and thought-provoking shiurim on each week’s Torah portion. Among the many prominent speakers and authors on OU Torah: Rabbi Shalom Rosner, Rabbi Dr. Tzvi Hersh Weinreb, Rabbi Moshe Elefant, Rav Avraham Chaim Feuer, Rav Chaim Ilson, Rav Aharon Kahn, Rabbi Jack Abramowitz, Rabbi Zvi Sobolofsky, Rabbi Dr. Asher Meir (The Jewish Ethicist), Mrs. Shira Smiles, Rabbi Immanuel Bernstein, and many, many more. Jewniversity Resources, by the OU, offers a really easy way for prospective college students to find the college that best serves their spiritual needs. Tapping on a marker will show the resources for that university. Each listed resource has contact information and other relevant tidbits, so you can take full advantage of your college experience. Students already enrolled in a university can take advantage of Jewniversity Resources as well, using the searchable list to find their school.